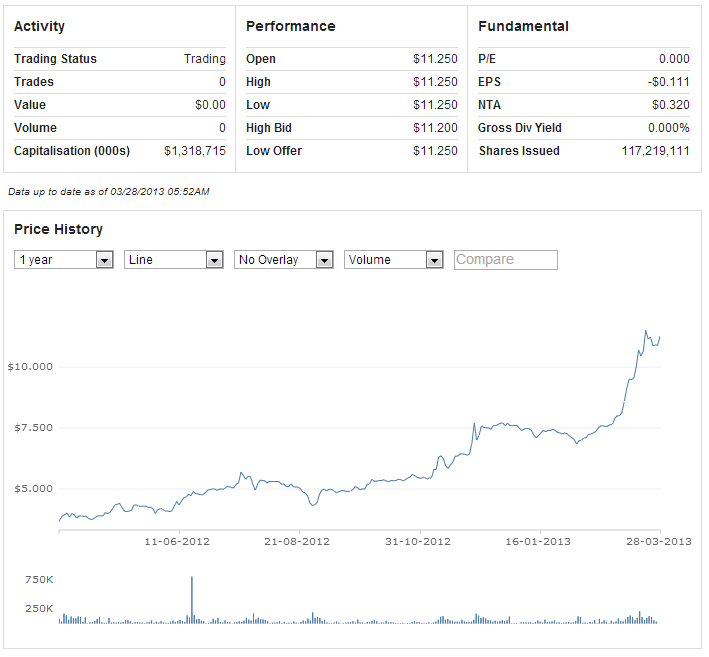 In recent weeks the share price for listed cloud accounting vendor Xero has risen at an incredibly fast rate. The company, which has around 140000 paying customers globally and is yet to turn a profit, is now valued at close to $1.5B. This is a staggering achievement and something I wanted to dive into a little. But first a bit of a disclaimer, as a proud New Zealand, I’m happy for what Xero has achieved, it’s great for the investors but, more importantly, it’s great for New Zealand as a whole. With the market cap as it stands, CEO and founder Rod Drury looks likely to achieve his stated aims; to build a billion dollar business from the beach and to achieve an exit at a higher price tag than that which TradeMe achieved. Personal ambitions aside, it’s time to noodle on the share price a little. The other day I was talking to a friend who told me that his retired father has suddenly discovered Xero on the bourse, and is considering investing. This is a reflection on the level of maturity of the New Zealand market and the investing public. It’s also, to be frank, a reflection on the fact that institutional investors and advisers have suddenly decided Xero is a sure bet, no doubt encouraged by the stellar share price growth. They’re buying the stock and advising their clients to do similarly. The day Xero entered the ranks as one of the top 50 market cap companies on the NZX they also suddenly gained visibility within the advisory community – the combination of a stock that isn’t heavily traded with this increased demand leads to an artificially high impact from low volume trades – this is great on the upside but painful on the downside. It’s actually very positive for the maturity of the company that they recently cross listed on the Australian exchange – it brings them a greater level of savvy investors that actually understand the dynamics of a potentially high-growth/high-risk investment. Drury has also signaled a possible future listing on the US exchange – this too would give both some stability and some liquidity to the share price – both positive things. For these reasons, and given the massive war chest of cash that Microsoft holds, the Yammer deal made sense. it may end up being a failure as a business division of Microsoft, but as a learning, marketing and corporate culture tool it makes sense. The cloud accounting space isn’t a zero sum game however and this creates another difficulty for Xero, it is unlikely that we’ll see a repeat of the emergence of a small number of companies that dominate in the three big geographies (Intuit in the US, Sage in the UK and MYOB in Australasia). Xero is helped by the fact that in the US there is no vendor that has really captured market share – Outright (recently acquired by GoDaddy) and Wave (an interesting company with a free model) are the two best known domestic providers, but potentially more compelling is FreeAgent, a UK based vendor that has recently entered the US market and is a savvy operator. Xero is executing well and their potential is massive. However potential only explains part of a business’ valuation, does Xero’s potential justify a $1.5B valuation? Not in my analysis – surely it may go higher as market frothiness and low liquidity combine to drive the economics, but eventually an equilibrium needs to be found, one that is based on customer numbers, market growth and eventual profit – we’re yet to see Xero deliver on that. An astute and well balanced assessment I think.